Andrew Marvell wrote of ‘these pictures and a thousand more, of these my gallery do store.’ One such captivating collection can be found in London’s National Gallery, which is currently running a free exhibition entitled Visions of Paradise: Botticini’s Palmieri Altarpiecce, showcasing new research on the masterpiece. Botticini himself is a mysterious artist, but through fragmented information about his life, the world he lived in, his associations and his beautiful art, eight fascinating facts about the master can be revealed. 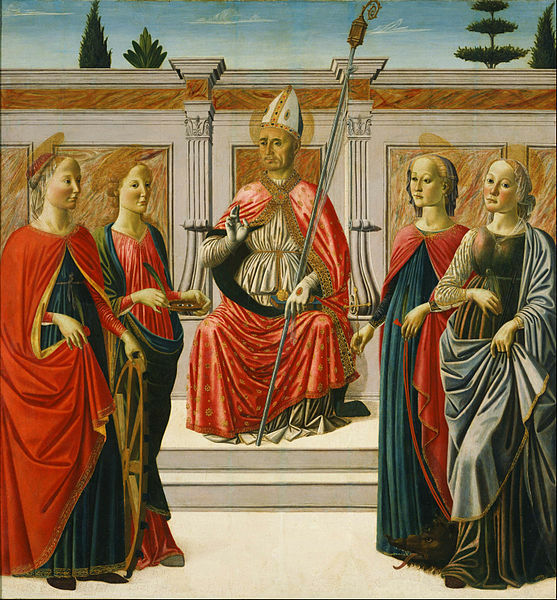 Francesco di Giovanni Botticini was born — the son of a painter of playing cards — in tumultuous times in 1446 Florence, one of the republics and duchies of Early Modern Italy that was uniquely placed to foster a cultural revolution. 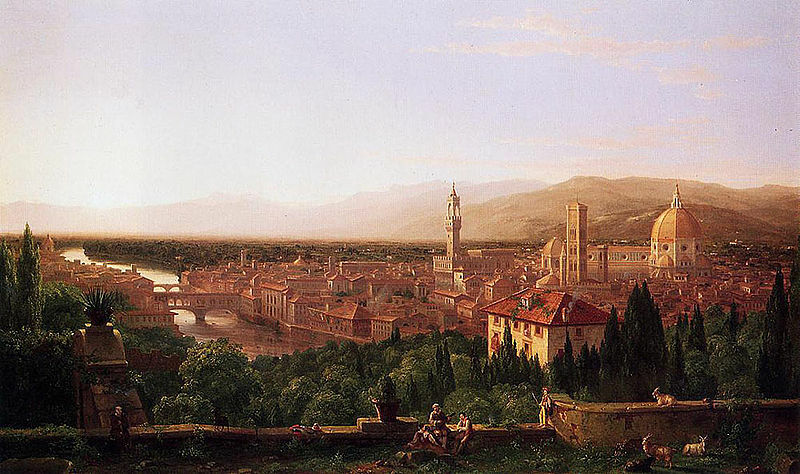 Florence was at the core of the former Roman empire, and, at the collapse of the Byzantine empire in 1453, became the refuge for the intellectuals of Constantinople — who brought with them many of the great works of the ancient Greeks and Romans, works that had been lost to the West during the Dark Ages. Still recovering from the Black Death a 100 years before and suffering regular plague outbreaks, the Holy Roman Empire had essentially lost power in Northern Italy, the papal states were governed by various leading families within each region. For most of the Middle Ages, the Italian peninsula was the playground of rival popes and ruling family dynasties, who paid mercenaries to fight set-piece battles where the outcome was often settled before the first blow was even exchanged. Like a 15th century mafia but with far more power, these families – the Medici, the Orsini, the Borgias – were far more powerful than the modern organisation as they made laws, controlled the church and had vast armies at their disposal. When Botticini was born, they had so much wealth that they could better afford to patronise the arts and sciences than almost anyone else. Botticini entered the workshop of a prolific painter of mainly religious themes, Neri di Bicci, in 1459 as a salaried assistant at the age of 13. From 1471 he was a member of the Confraternity of the Archangel Raphael at Santo Spirito, and in 1472 he was inscribed in the Confraternity of St Luke, a sort of talent academy for the elite, in some ways like the BRIT school today. Confraternities were everywhere in pre-modern Europe and played an important part in the lives of devout Catholics of all social classes. Regions like Florence, in particular, were fertile territory for the growth and proliferation of these religious associations. Botticini would have devotions, education, recreational games (in their own ball-courts), musical and theatrical performances, ceremonial self-flagellation and sermonising. These confraternities went into a decline during Enlightenment attacks in the 18th century. The term ‘Renaissance’, used to describe the new types of fine art which suddenly emerged in 15th century Florence, was first coined much later by the 19th century French historian Jules Michelet. The cultural and artistic events of 15th century Italy are collectively referred to as the Quattrocento — from the Italian for the number 400. Quattrocento encompasses the artistic styles of the late Middle Ages, most notably the International Gothic and the early Renaissance. The qualities that gave Italian Renaissance art its distinctive flavour during the Quattrocento era included a passionate desire for knowledge and a dedicated belief in experiment, especially the kind that puts knowledge to the test. Botticini and his contemporaries of the Early Renaissance would have proudly called themselves Quattrocento artisans, who switched in general from illuminated manuscripts and other forms of book illustration to panel paintings and other large-scale works like fresco painting. At the same time decorative art such as stained glass and mosaics also declined. The Renaissance philosophy of Humanism (a cultural and literary legacy, as well as moral philosophy of classical antiquity) led to a move away from decorative painting – in the style of Byzantine icons – in favour of greater realism and a focus on male nudes and, to a lesser extent, female nudes. Religious art continued to dominate Botticini, but secular history painting and portrait art began to proliferate. If you look at any masterpiece of a great artist like Botticini, they have a sublime quality that is linked directly to the landscape, to nature. This is because they made their own colour pigments, having no way of walking into the nearest B&Q and buying paint. Botticini was an expert in minerals dyes, earth materials and chemical processes. For example, the plants, bones and woods of the area would have been boiled or burnt to make sap green and lamp black. Lead and iron, oxidised or cooked, would make dangerous and noxious but effective flake white, red, black and yellow. Botticini himself loved using bright primary colours in his art. Francesco Botticini depicted in seven different versions a Bible story which was popular with merchants and travellers, particularly in late 15th century Florence, from the Book of Tobit in the Old Testament Apocrypha. The story tells of Tobit, a devout Jewish man from Nineveh, who was blind and had fallen on hard times, sent his son Tobias to collect a debt of ten talents of silver from a family member that lived in the city of Media. 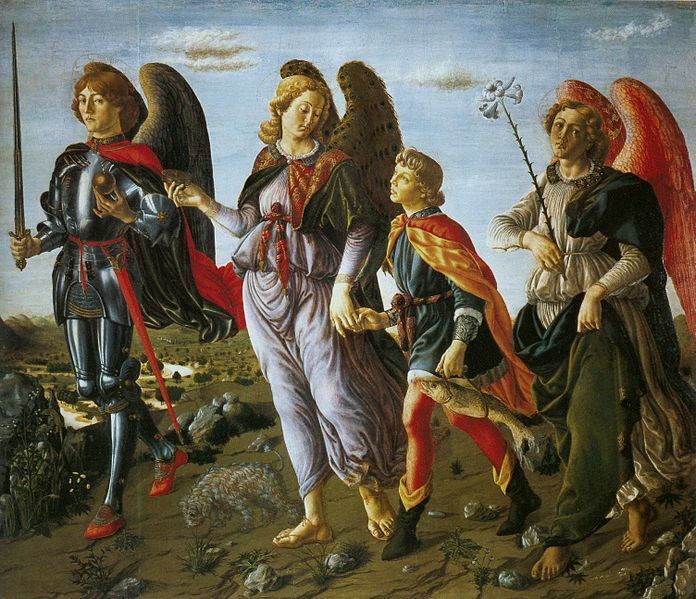 Raphael, one of the seven Archangels, accompanied the boy, masquerading as a relative named Azariah. As well as The Assumption of the Virgin, there are three other sumptuous paintings by Botticini to admire at The National Gallery. 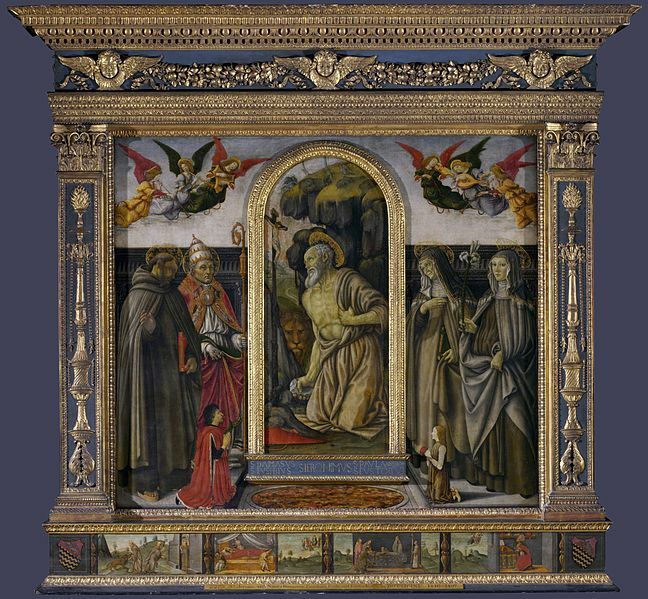 Saint Jerome in Penitence with Saints and Donors, Scenes from the Life of Saint Jerome: Predella and The Crucifixion. 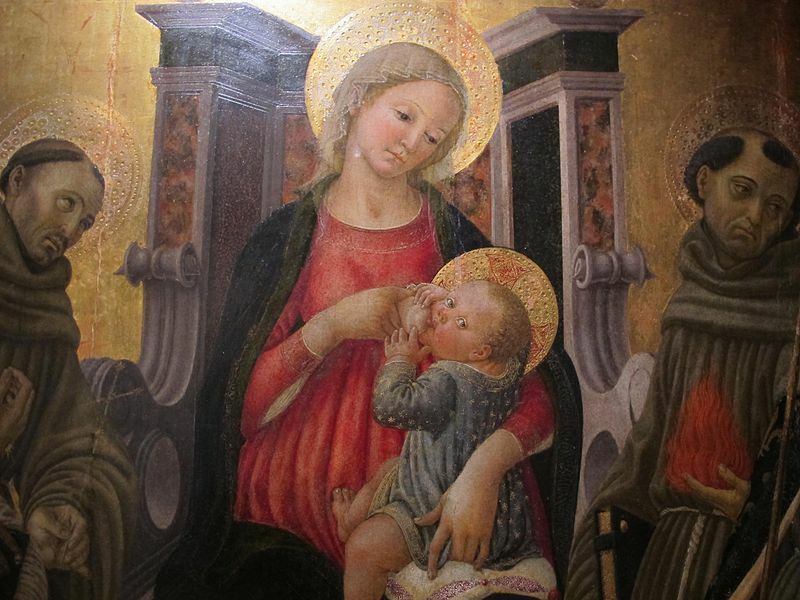 Two others are displayed outside London too — the Virgin Adoring the Child at the Fitzwilliam Museum, University of Cambridge, and Saint Nicholas of Tolentino at the University of Oxford. The masterpiece’s donor, Matteo Palmieri — a true Renaissance Florentine scholar, doctor, historian, biographer and philosopher — commissioned Botticini to illustrate his epic poem ‘Citta di Vita’ (City of Life) in 1465, written in homage to Dante’s Divine Comedy’, which described the poet’s journey through Heaven, Hell and Purgatory. However, after Palmieri died, a theological reinterpretation of the poem by the Catholic Church branded him a heretic for having views about the origins of the human soul and the notion of Free Will that differed from the Catholic Church. He espoused the view that human beings were not conceived by parents at all but had pre-existed as angels, and he believed that human souls are the angels who stayed neutral when Satan rebelled against God. 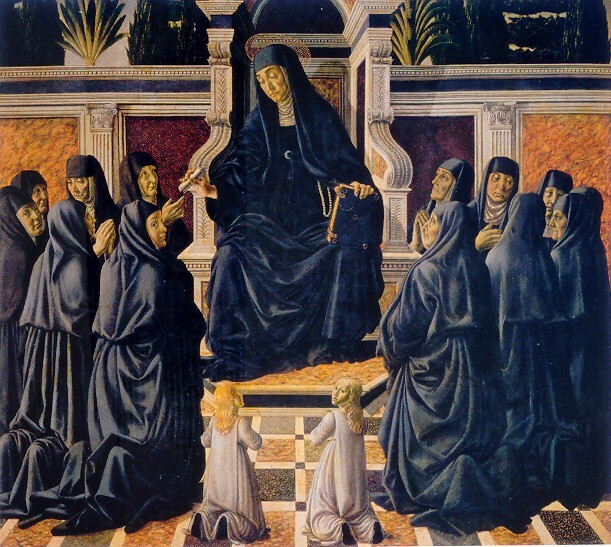 Nothing directly in The Assumption of the Virgin Palmieri Altarpiece shows us this theological view but the mere association with Palmieri was enough to get the painting vandalised and covered up. Looking into the Future: Did Botticini Paint U.F.O’s? Italy’s Old Masters were recording flying saucers and UFOs in their paintings as far back as the 15th century, according to investigators like archaeologist Robert Volterri. 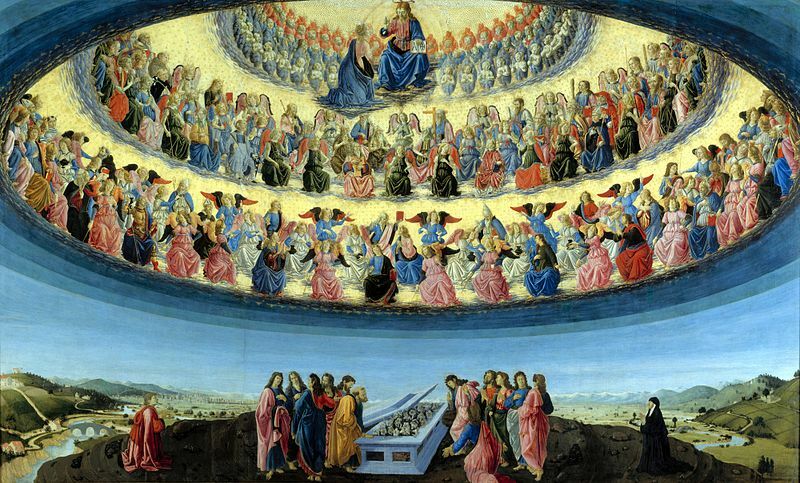 Botticini’s masterpiece The Assumption of the Virgin with its cathedral-like dome in the sky, filled with saints surrounding the Virgin, has been interpreted as a giant U.F.O. filled with aliens. Volterri believes that people from Botticini’s time were visited by extra-terrestrials. 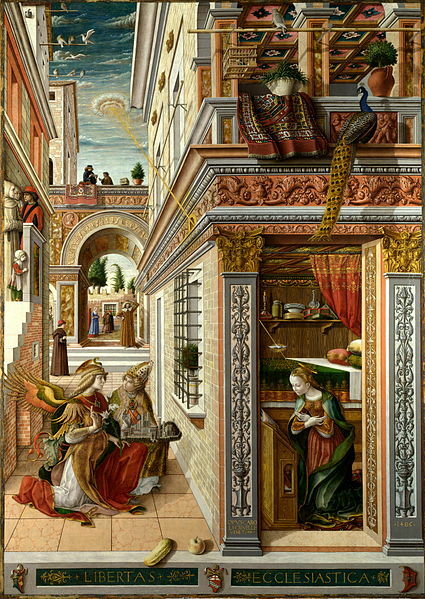 Another striking example is from a contemporary of Botticini — Crivelli and The Annunciation with Saint Emidius — that shows a disk shaped object shining a beam of light onto the Virgin Mary. This can also be found in the National Gallery. The exhibition runs from the 4th November 2015 until the 28th March 2016. Yasser is a comic performer/stand-up comedian/writer and actor. He performs regularly with comedy sketch groups Chaos Theory and Monkey Wedding.